SEATTLE -- Excuse Pete Carroll this week if he's a bit miffed at a former college colleague. SEATTLE — Excuse Pete Carroll this week if he’s a bit miffed at a former college colleague. Oregon coach Chip Kelly did no one in the NFL any favors by passing along tips to New England about how to let Tom Brady run the Patriots breakneck offense even faster. “The fact that they’ve studied with Chip, and he’s kind of helped, I’m still kind of (mad),” Carroll joked this week. Brady and the Patriots (3-2) visit Seattle (3-2) on Sunday in a matchup of the NFL’s top offense against the Seahawks’ No. 1-ranked defense. Last offseason, Patriots coaches spent time with Kelly’s staff. They learned how the Ducks run their high-tempo offense with such efficiency, and found out what aspects might translate into the NFL. In the hands of Brady, the modifications are pretty good. “I think we have several different tempos that we try to play at. Sometimes you go no-huddle; sometimes we have to slow it down. 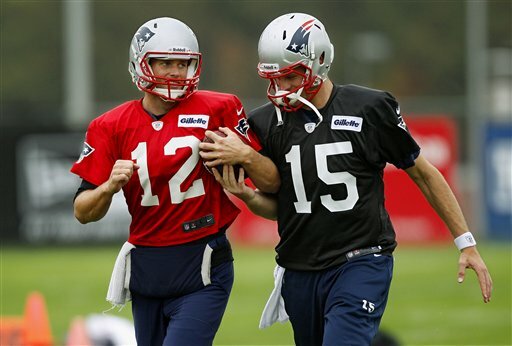 It’s all really a matter of how the game is going and how we feel is the best way to attack the other team,” Brady said. Despite the always changing numbers throughout a 16-game season, matchups of the top offense facing the top defense don’t come along often. And while it would seem there is very little in common between the Patriots and Seahawks, the underlying root of why New England’s offense is proving so potent and Seattle’s defense so stout is the same: Speed. For New England, it’s the speed at which they run plays. Last week against Denver, sometimes it took as little as 15 seconds between the end of one play and snapping the ball for the next. For Seattle, it’s the speed of its pass rushers off the edge that combines with the quickness and size of their linebackers and secondary that makes it tough on opponents. There hasn’t been a matchup of the No. 1 offense against the No. 1 defense in Week 6 or later since the 2007 season when the top-ranked Patriots’ offense overwhelmed the No. 1 defense of the Steelers in a 34-13 victory in Week 14. And if New England wasn’t potent enough with Brady flinging passes around to Wes Welker, Rob Gronkowski and Brandon Lloyd, the Patriots have added a new element with the emergence of running back Stevan Ridley. The second-year back from LSU is coming off consecutive 100-yard games and if he can add one more against the Seahawks, he’ll be the first Patriots’ back with three straight games over the century mark since Curtis Martin in 1995. The improvement of the run game is partly why the Patriots have 101 first downs in the past three games, the most by any offense in a three-game span since the merger. In 60 offensive possessions, the Patriots have just four three-and-outs. Seattle has not allowed a touchdown to an opposing offense since the fourth quarter of its Week 3 win over Green Bay, a span of 128 minutes. It will be a challenge to keep the streak going against Brady, but the Seahawks would like nothing more than to make his first trip to Seattle forgettable.